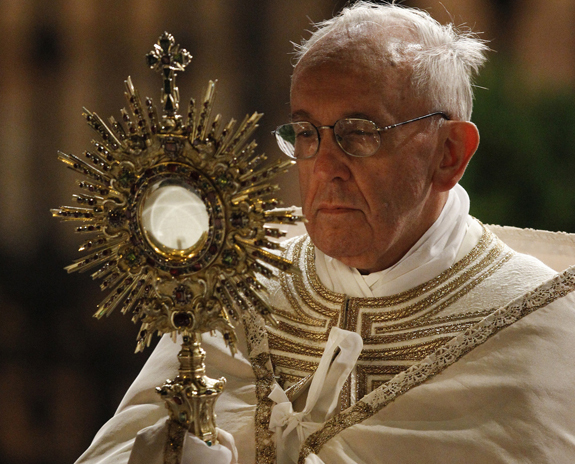 Today is the Solemnity of Corpus Christi, or the Body and Blood of Our Lord Jesus Christ. Why is so much attention given to the Body and Blood of Christ? Well, basically because Our Lord suffered and died for us. He gave His Body and shed his blood so all can have the doors of Salvation opened to them. Moreover, Christ emphasized the importance of His Salvific work on the Cross by leaving us the Holy Eucharist. During the Last Supper, Our Lord took bread and wine, blessed it and distributed among the Apostles saying that they were His Body and Blood. He instructed them to do this in His memory. (Luke 22:7-20) In other words, this meal was not a one-time thing. It had to continue. Was Jesus joking around when He said that bread and wine were His Body and Blood? The answer is no. In John 6:22-69 Jesus gave a long talk about the "Bread of Life." He goes on to say that the bread Moses gave wasn't the "True Bread." 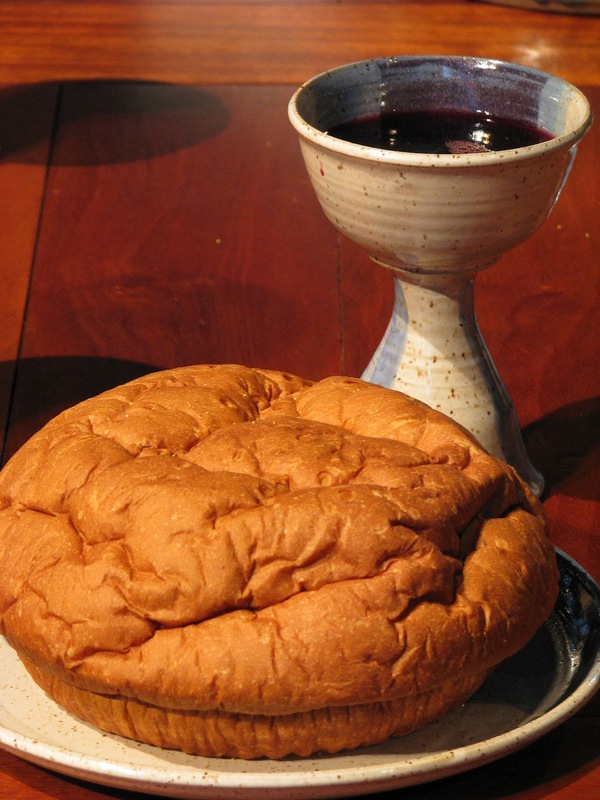 The people asked Him for this "Bread of Life" and He then makes the radical statement that HE is the "Bread of Life" and the "True Bread from Heaven." The people began to murmur among themselves because they knew Jesus was the son of Joseph, and not to mention that His words were a bit strange and in today's postmodern world would be interpreted as psychotic and delusional. However, it gets "stranger," so to speak. Jesus continues saying that one has to "eat His flesh and drink His blood in order to have eternal life." This is when the people really had enough. Many walked out on Him thinking He was a lunatic or a delusional. Jesus then turns to His disciples and asks them if they will leave as well. Peter replies saying that they can't go anywhere else because Jesus had the words of eternal life. Peter is always the first to speak up or to lead, this shows why the Pope is the first bishop among all bishops of the world. Moreover, something interesting happens here in regards to how serious Jesus was about eating His flesh and drinking His blood. Many of our separated brothers and sister in the Protestant faith believe the Holy Eucharist is a symbol and not literally Christ's Body Blood Soul and Divinity. Let's think about this for a moment: When people started abandoning Jesus for saying that one has to eat His flesh and drink His blood, Jesus didn't run in front of them and say "hey, wait a minute, I was joking." Instead, Jesus let them go. This shows that He was very serious about His flesh and blood being actual things or foods that someone has to consume. In 1 Cor 10:16 St. Paul reminds the people that the bread and wine are the Lord's Body and Blood. He never calls them a symbolic representation of them. In Genesis 14:18 we read about Melchizedek - priest of God and king of Salem- giving Abram bread and wine. He then blesses Abram. Jesus uses bread and wine to make the connection to the Old covenant and to show that He is the True Priest who offers the True Sacrifice - Himself. Bread is a food that is delicious. It has a lot of carbohydrates which in turn gives a lot of energy to the body when burned as calories. It is a food that is easy to make, but does a lot to appease hunger and give nutrients. Then there is wine. It is used to party with and used as medicine as well as a disinfectant agent for wounds. Jesus as Bread and Wine does exactly that to our souls. He appeases the hunger for God and nourishes the soul. He brings our souls to jubilation by uniting with it when one receives Holy Communion. He heals the soul from the harm sin has caused. One may ask: at Mass, the Bread and Wine still look, taste, smell, feel like Bread and Wine, so how can it be the Body and Blood of Christ? Well, God knows us well. 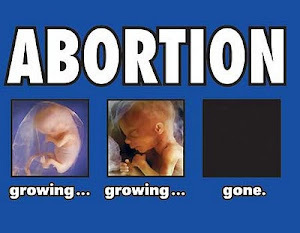 God designed the human body and mind. He knows that human beings would cringe at the sight of eating raw meat and drinking blood. How many times have we ourselves have gotten disgusted at looking at our own wounds? It is not easy seeing blood and flesh in a traumatic form. A few years ago, there was a big story about the "Zombie" in Miami which involved a man high on "bath salt" drugs who attacked a homeless man and literally ate his face. People were disgusted at the news and the reality of how a human can even succumb to this evil cannibalistic act. That being said, God would not give us tangible and biologically tactile flesh and blood to eat and drink in the sense we are used to. Rather, He would use matter that we are all familiar with and that we enjoy: food and drink. At consecration, the Bread and Wine do not turn into a piece of meat and human blood with DNA, platelets, red/white cells etc - unless a Eucharistic Miracle has taken place which sometimes does occur. The outside, or the accidents of the bread and wine remain the same, but what it is, or the essence changes. Think of it this way: We see leaves on trees. During spring and summer, they are green. However, during fall they begin to change colors. They turn red, orange, yellow and brown. Now let's think: which one is the REAL leaf? At one point it was green, then red, then orange, then yellow and then brown. The leaf changed colors, so is it the same leaf when it was green? The answer is yes. The outside or accidents of the leaf changed, but the essence or what it is, remains the same. The same with the Bread and Wine at Mass but in an opposite manner. The outside remains the same (bread/wine) but the inside or what it is changes and becomes the Body Blood Soul and Divinity of Our Lord Jesus Christ. Similarly, we ourselves go through many changes. Our bodies grow and change as we age; however, our temperament remains the same. These actually come from the Jewish Shabbat table ritual. It reminds us of our Jewish heritage since Christ did not come to abolish the old (Matthew 5:17). The sacrifice of Melchizedek was a foreshadowing of the Holy Eucharist where Jesus would be both priest and sacrifice (Hebrews 10:10). This is why today's responsorial Psalm says, "You are a priest for ever, in the line of Melchizedek." Jesus sits at the right hand (Acts 7:55, Ephesians 1:20). His enemies are His footstool showing He is above all. Jesus rules over all people. He is a prince or royalty since birth, the King of the Jews and all mankind (Isaiah 9:6, Acts 2:30, Revelation 19:16). The true sacrifice is Jesus who died on the cross and had His blood shed for all of us as expiation for our sins (1 Timothy 2:6). Jesus' sacrifice on the cross was done once and is efficient for all to be redeemed (Hebrews 7:27). Many of our Protestant friends believe Catholic priests "re-sacrifice" Christ over and over, this is not true. The Sacrifice at Mass is a remembrance or reenactment if you will, of the salvific events of the Passion of Christ (CCC, 1366-67). In the Mass, we receive the Holy Eucharist and participate in the "cup of Salvation." Today's second reading reminds us that what we have received, or tradition, is that Jesus took bread, said the blessing and said that it was 'His body.' 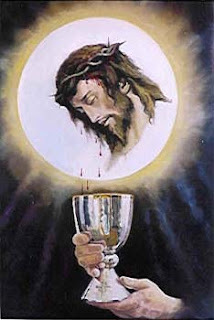 Similarly, He took a cup and said that it was a sign of the 'new covenant' and that it is 'His blood.' Jesus said to have this meal in remembrance of Him until He returns. The Mass comes to us directly from Christ. Christ asks us to remember Him via the Holy Eucharist. Christ is truly present in the Holy Eucharist. This sacrament is not a symbol, but truly the body, blood, soul and divinity of the Lord and Savior Jesus Christ. This is important to take in and meditate on. 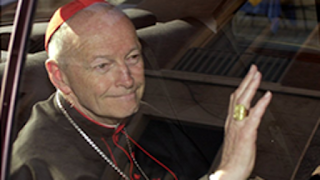 The Mass is not a 'social gathering.' It is not an 'obligation.' The Mass is a remembrance of Christ. Jesus is not re-sacrificed. Finally in the Gospel, we read of the multiplication of loaves and fishes. Jesus speaks to the crowds about God's kingdom and performed miracles. The disciples wanted Jesus to get rid of the crowds, but Jesus told them to go feed them instead. However, they only had five loaves and two fish. With these, Christ fed 5,000 people present. Notice that the amount of food Christ used to perform the multiplication was seven (5 loaves + 2 fish), God's number which means perfection. The Gospel reminds us that Christ feeds us via the Holy Eucharist. He acts via the priest who is the disciple; remember, Jesus told the disciples to feed the people. The people had their fill after this miracle. This miracle was done shortly before Passover and is linked to the Last Supper. Christ will feed the people via the disciples and continues to do so today via our priests. 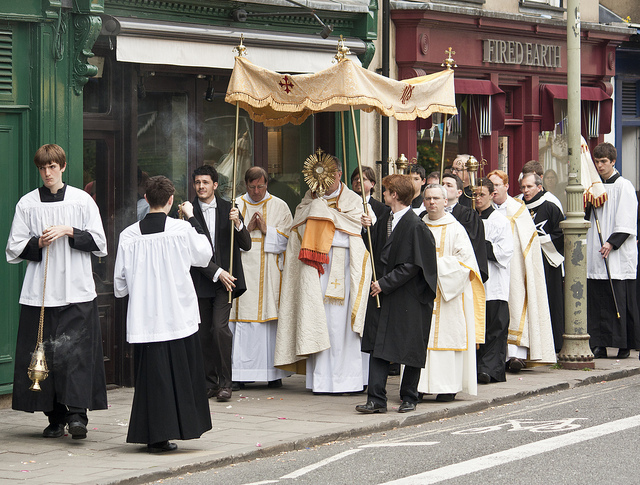 Corpus Christi is a day to reflect on this and thank Our Lord for remaining with us in hidden form under the appearance of Bread and Wine. Many dioceses and parishes have processions on this day. They process through the parish area with the Blessed Sacrament in a Monstrance or Ciborium. This is an awesome event and I wish every parish and diocese did this. 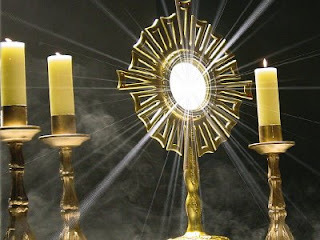 I also urge you to visit our Lord in the Blessed Sacrament and spent time with Him. Many parishes have Eucharistic adoration for a period of time, sometimes perpetually. There is nothing like getting lost in the presence of Christ in the Blessed Sacrament. 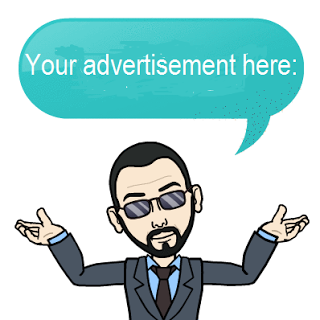 Go visit our Lord, share your life, your activities, your stresses, your desires, etc. He is there waiting for you. 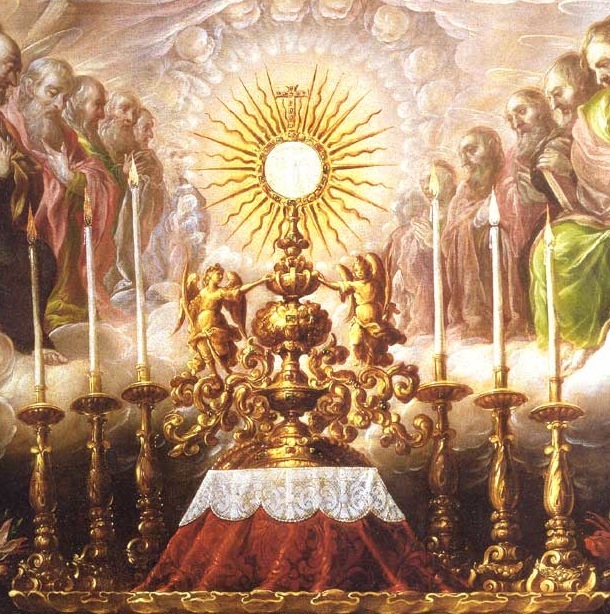 May Jesus present in the Holy Eucharist be praised forever!